Hosted by Jo & Neill Meneer, a great start to 2019 — a chance to start networking, including a mini photographic workshop. Sports and active wear with a difference, bringing fashion and function together. A really innovative business model and a chance to find out more about how this business work. 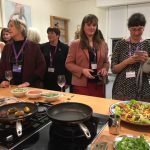 How they support and make a difference to women's sport! Some great networking too! Not to be missed! Networking, AGM, Workshop/Guest Speaker: Stephanie Hill, a recently published author and founder of Laughtercise! 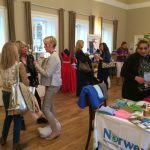 Fun, fizz and the best networking around. A chance to see what goes on at one of Bath's brilliant colleges. This time with the floristry department. Flowers, Fizz and friends, what's not to like. Networking with a difference! In conjunction with BBWA member Bev Lee and her amazing Clayzer. Try you arm (and aim) at lazer shooting. The fabulous Homewood Park are hosting this event and you will get a chance to see the hotel as well as well as trying out one of the Clayzer guns. If you're looking for something different for an event you may be planning then this one is for you. 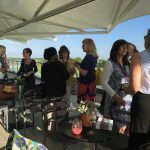 A fabulous setting for a late spring evening with fizz and fun and lots of chances to network. 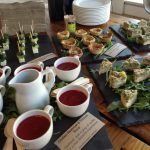 This summer we are delighted to have been invited by Bath artist Emma Rose to a summer networking event at her fabulous art studios at Wellow on the edge of the city. Emma is one of Bath's award winning artists and we are delighted to be able to at last get a networking event with her - something we have been trying to do for ages! A real networking event with music, art and plenty of summer fizz! This .is an event for everyone, so bring husbands, partners, colleagues and friends. A networking treat. We are so lucky to have our very own Bath Blue Badge Guide. For the last few years Nick has been walking us around Bath and showing us parts of Bath you may not know about. His knowledge of Bath's history is immense and we always learn something new. So please come and join us for what is always a great 'netwalking' event, ending in a local pub of course! Thanks Nick, we're already looking forward to it. AUGUST - no event - enjoy your summer holiday! Fizz and fashion! What could be better. Hosted by the team at BoHo it will be a great start to autumn with a chance to network and find out more about this great Bath business. Our annual visit to this amazing wine warehouse. This is like an Aladdins Cave, full of some of the most wonderful wines you can imagine. A little cheese and some amazing wines to taste as well as some great networking. Always a great night. The BBWA's link with the Royal High School in Bath is one we are extremely proud of. This is our chance to give something back to the next generation. Those of you who joined us in 2017 will remember that over 60 sixth formers joined us for a brilliant night of networking. This was the first time most of them had ever had the chance of doing something like this and the feedback we got was terrific. As the BBWA we are proud to be networking ambassadors. After all these young ladies are the future business women in the UK. Please come and join us tonight and help them get a head start in the networking world. It's Christmas and time to start winding down. A real Christmas networking special with Tim and his team at Picnic. Old friends of BBWA, Tim always comes up with something pretty amazing. So get into the Christmas spirit with some fizz, funky food and a great start to the festive season.